Hotel chains are thriving, for now, thanks to innovation and a bit of luck. The 41-story clock tower at Five Madison Avenue was once the domain of insurance clerks working for Metropolitan Life. Now, the building in New York is a swanky hotel, called the Edition, where beautiful people air-kiss in the lobby. The hotel sector has undergone a similar switch from toil to glitz of late. Arne Sorenson, boss of Marriott, an American hotel firm that owns the Edition brand, says that business has rarely been better. The hotel industry ought to be in a worse state than a hung-over guest who has drained the minibar. The financial crisis caused commercial-property prices to collapse and rooms to remain vacant. Hotels have suffered relentless disruption from the internet. Online travel agents, such as Expedia, take hefty commissions for bookings and sharing-economy upstarts such as Airbnb offer a cheap alternative. Yet the large American and European hotel firms are thriving. The industry’s favoured measure of success, revenue per available room (RevPAR, revenue divided by rooms available in a given period), has climbed for the past five years in America, surpassing peaks in 2000 and 2007, according to Smith Travel Research. Meanwhile, money is pouring in from private-equity firms and Chinese and Middle Eastern investors, keen to take advantage of the growth. Properties worth $42 billion changed hands worldwide in the first half of 2015, a 56% jump over the same period last year, according to JLL, a property broker. How have they done it? 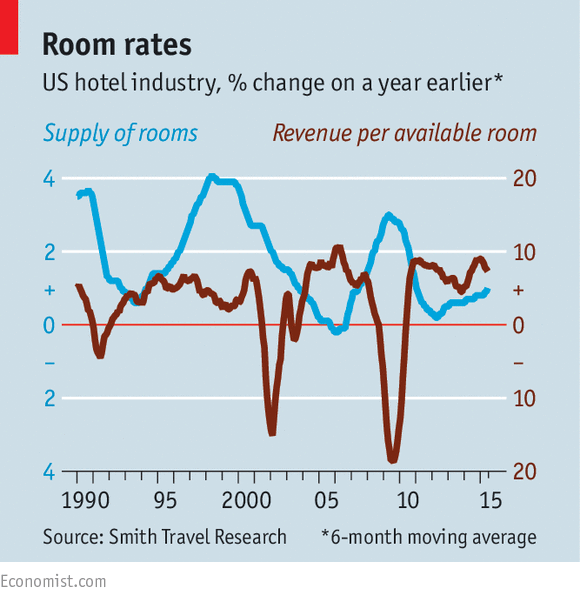 Hoteliers are nimbler and more resilient than they were two decades ago. For one thing, they own fewer hotels. Of the 4,942 hotels operated by InterContinental, a giant British firm, it owns just eight. The “asset-light” approach brings in franchising and management fees. Investors like this, explains Smedes Rose of Citigroup, a bank, as the firms can concentrate on operations without worrying about seesawing property prices. And by leaving expensive upgrades to owners, they can pay more dividends. Hotel firms have also broadened their base of customers in two ways. First, they have created a variety of lodgings for different travelers. The top five hotel companies have more than 60 brands between them, serving everyone from families to thrifty businessmen and health nuts. Second, the big chain hotels are courting more travelers around the world. International brands swiftly moved to control about half of the rooms in fast-growing markets such as China and India. Relinquishing property ownership has helped. Firms can speedily export their management model while local partners do the riskier work of building the hotels. The downturn after the financial crisis proved the power of this transformation. Room prices and occupancy rates collapsed. But property owners suffered most while hotel firms continued to receive fees from them. A diverse selection of accommodation, at a wide variety of prices and in locations across the globe, helped hotel firms survive and then rebound. What has recently supercharged the industry, however, is a stroke of luck — an unanticipated shortage of rooms in America. Investors expected success in emerging markets but slowing growth and a strong dollar are depressing revenues. In America, where the big firms still earn most of their profits, business is booming. The supply of new rooms grew slowly after the downturn. But demand has picked up along with the economy. Occupancy rates sank to a low point in 2009. They are now expected to reach a record high this year. Investors have begun to wonder how long this can last. Shares in four of the five largest hotel firms have slipped in recent months despite rumours of dealmaking. On July 30 InterContinental denied reports that it might buy Starwood, an American rival; its target is now reportedly Fairmont, another chain. The foreboding reflects two threats. The first is cyclical. Demand moves quickly. Supply is sticky. This mismatch has helped hotels so far, but it could turn against them. Soaring demand is encouraging new building. By the time properties are finished and a slew of new rooms are available, demand may have ebbed. In the past, RevPAR has plummeted as supply has risen (see chart, above). Steven Kent of Goldman Sachs, another bank, argues that supply is poised to outpace demand. The second, more structural threat is technology. The candid reviews on sites like TripAdvisor make controlling customers’ views of hotel brands much harder, points out Kent. Online travel agencies, such as Priceline and Expedia, want to win a bigger share of bookings. That worries hoteliers, who often pay commissions of 20% or more. Expedia’s clout may grow — it is trying to buy Orbitz, a rival. Room-sharing sites such as Airbnb are another menace. Hoteliers tend to shrug off such concerns by pointing out that Airbnb serves few business travelers, the main customers for hotels. But Airbnb offers not only low prices but access to more than 1.5 million rooms, roughly double what InterContinental offers. The headaches from online travel agents, room-sharing sites, and review websites will probably intensify as the three start to overlap. TripAdvisor, for example, now has a booking system and has bought four companies that specialise in renting homes online. Faced with these challenges, hotel companies are adapting, yet again. Accor, a French firm, is trying to fight online travel agents by beefing up its own booking system and opening it to independent hoteliers. Hyatt, an American firm, has invested in Onefinestay, a rival to Airbnb. Marriott has said it will go into partnership with TripAdvisor, using its booking platform to get more information about customers, so it can market to them more effectively.